Farm-raised Atlantic salmon move across a conveyor belt as they are brought aboard a harvesting boat near Eastport, Maine, Oct. 12, 2008. State regulators have issued a wastewater discharge permit for an on-shore salmon farm proposed for the old Verso Mill site in Bucksport. 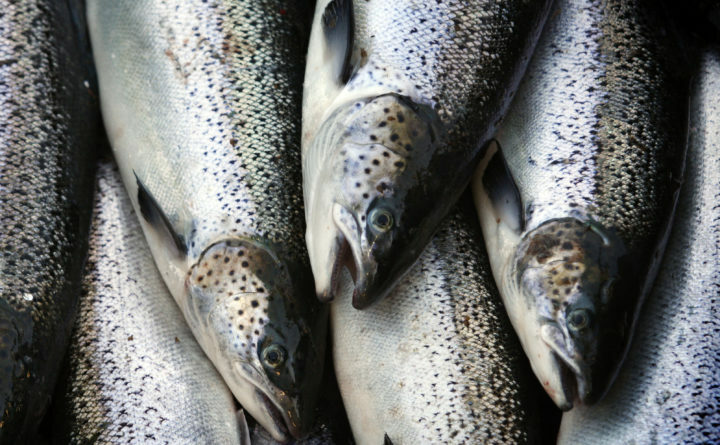 The company, Whole Oceans, eventually hopes to raise 44-million tons of salmon per year. Brian Kavanah, an acting director of the Bureau of Water Quality at the Maine Department of Environmental Protection, says the 18.6 million gallons of treated water that will go into the Penobscot River daily should not pose a threat to water quality. DEP reserves the right to impose new conditions if water quality issues emerge once the plant goes online. He also says DEP will continue to evaluate best practices as the developing large-scale on-shore salmon industry grows and innovates. Another big salmon farm, proposed for Belfast by Norway-based Nordic Aquafarms, has applied for a wastewater permit as well.